Back in the late 80’s I picked up a book that profoundly changed my life. It taught me how to model excellence, how to better communicate, and what it really means to take responsibility for your actions and results (or lack of results). 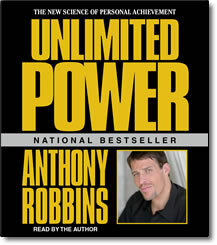 The book is called Unlimited Power by Anthony Robbins. And if you haven’t STUDIED it like your life and finances depend upon it (because they do; they most certainly do) then I encourage you to go make that happen. Check the library or a used book store. Two things really stood out for me. One is the idea of being able to model success. Meaning if you know of anyone producing a result you desire – you can absolutely produce the same result if you can MODEL (copy) their processes – both mental and physical. How, specifically, do they think about producing the result? Do they focus on it being hard or easy? Do they focus on solving problems or eliminating them? Who do they coach or mentor with, and why? What are they reading? Studying? What specific ACTIONS do they take to produce the result? What is the process? Can you duplicate it? When they first started, what specific actions and steps did they take. Then what? Many people succeed in franchising because they find something that works in one city and do the same thing somewhere else. I mean, if pizza sells well in Chicago… it should also sell well in Reno, NV. Right? That’s the easiest way to ‘success’ that I know of… simply copy a proven system. Again and again. All you have to do is take a proven system and duplicate it – and maybe even better, improve upon it. People who do this are virtually guaranteed success. In fact, on a personal note, though I am currently the #16 top income earner in the company for my primary network marketing business – it is my intention to hit the TOP 10 in the next 6-12 months. So what I’m doing now is contacting EVERYONE who earns more than me in the company to find someone willing to mentor me and hold me accountable. I want to COPY a proven success model… not invent one. When I stopped “selling” to earn a commission and started offer “solutions” – the commissions started flowing out of control. When I stopped spitting out a canned presentation consisting of the things I thought were exciting or important and starting caring enough to ask my prospects what mattered to THEM – people started teaming up with me in droves. When I stopped being concerned about perfecting a polished presentation on stage and started, instead, to sincerely want to uplift and edify and add value to the audience – I was invited to speak far more often. Caring enough to care means being INTERESTED versus striving to be interesting. Yes what you share is correct! Yes I agree with what you share.